More from my FD Indonesia adventure! Home » More from my FD Indonesia adventure! In a series like this there is a lot to look at all the time. I tried to take as much in as possible, but at an event that’s this important, I mostly stay busy keeping an eye on my car and it’s preperation ahead of the next session. But I made sure I soaked up as much as I could when I had the chance! 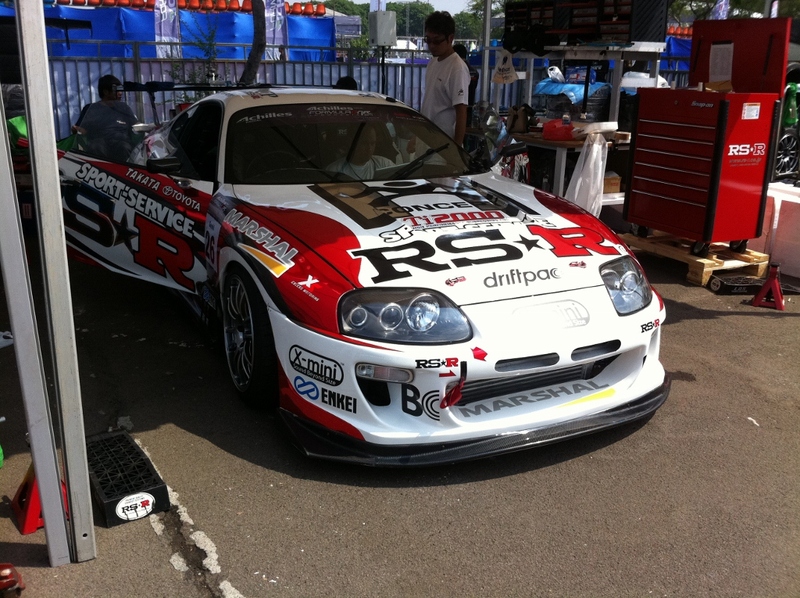 One car that was pitted only 3 bays up from me was the RS-R Supra, although it was having dramas keeping driveshafts intact thanks to its triple plate clutch and dog box, I was very impressed! Taking a closer look at the car ahead of the first practice session, I noticed one of the Japanese mechanics working away on the laptop inside the car. There is a lot of preparation, checking and double checking that goes on when a car is shipped to another country. When we brought my S15 to Singapore for round 1, there were a few small adjustments to make to get it running the same as it did in Australia. So considering the temnperatures in Jakarta, I’m sure there would have been a significant difference between Indonesian and Japanese conditions. 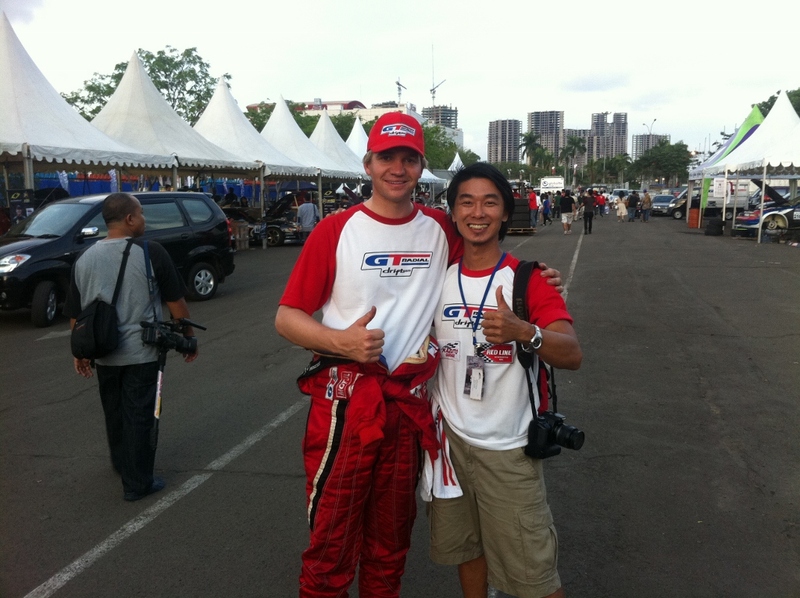 This is me and my good friend Soon, he was vital for anything regarding communications with the local mechanics and drivers. Without him, I would have found it very difficult when it came to explaining the finer details of the car setup, and what changes needed to be made. He was also my spotter for this event, and his insight and honesty was a huge help in making sure I was doing what the judges wanted to see. As Soon is a Malaysian, he is getting everything in place for me for round 3 of FD Asia coming up on the 17th & 18th of December in Kuala Lumpur. I look forward to working with Soon for the coming rounds and I know we will be a great team! And here I am congratulating Pond, the man who really gave Daigo Saito a hard time in the top 4. He took him to not 1, but 2 one-more-times! He is a very friendly guy, always greeting you with a smile, a very deserving podium finisher! Also, keep and eye out, as I will post up the youtube link of the ESPN live broadcast from this round very soon!